The Local Government Unit of Jagna is in the thick of preparations for its upcoming activities this December 12, 2015. 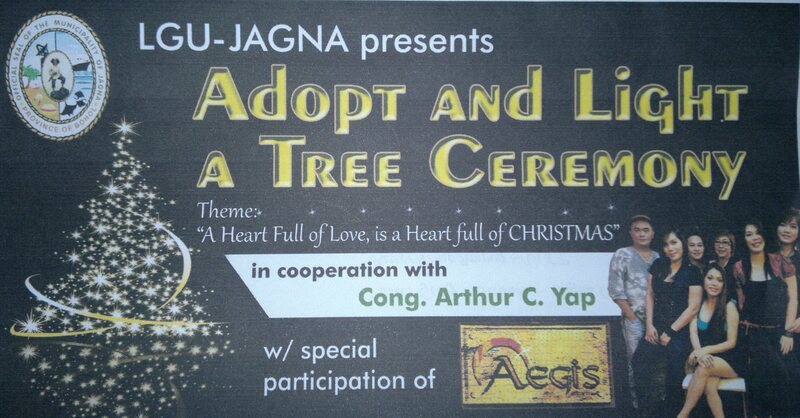 The annual Adopt and Light A Tree Ceremony with the theme “A Heart Full of Love, is a Heart full of CHRISTMAS” will be launched at 7:00 in the evening at the Jagna Insular Plaza. 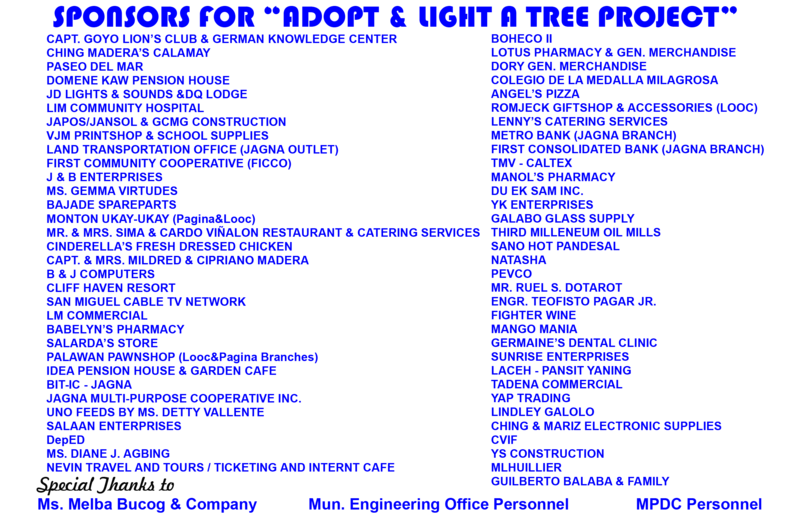 This activity is in cooperation with Cong. Arthur C. Yap who is sponsoring another major activity bringing to Jagna Aegis for the Jagnaanons to enjoy their music. The launching of the Adopt and Light A Tree Program will commence with a with an ecumenical prayer to be led by Most Rev. Msgr. Ignacio H. Reyes to be followed with a “Peace Prayer” by the different religious groups Pastor Gerry V. Araneta of the Jagna Christian Gospel Fellowship; Pastor Tenie Ampog of the UCCP; Pastor Giovanni Prete of the Grace Gospel Church of Christ; Bro. Iluminado B. Paguican of the Assembly of God; Ali Akbar Maruhom of the Muslim Sector. Rationale will be provided by Hon. Maricris V. Jamora with Mayor Fortunato R. Abrenilla for the words of welcome as well as leading the countdown to the lighting ceremony. Acknowledgement of sponsors and distribution of certificates will be done by Vice Mayor Bonifacio J. Virtudes, Jr. From thence will be a fireworks display courtesy of Drs. Theodore and Belinda Abrenilla to be followed by the mass singing of Kasadya Ning Taknaa. After the lighting ceremony will be much-awaited Aegis concert sponsored by Congressman Arthur Yap. The event is expected to draw in a huge crowd not only Jagnaanons but from the third district of the province. Peace and order and security of the area care of the Jagna PNP and selected barangay tanods.